I’m attending the Nordic Knitting Symposium this week. Five days of knitting and museums – I’ll return to that when it’s over and I have time to breathe. 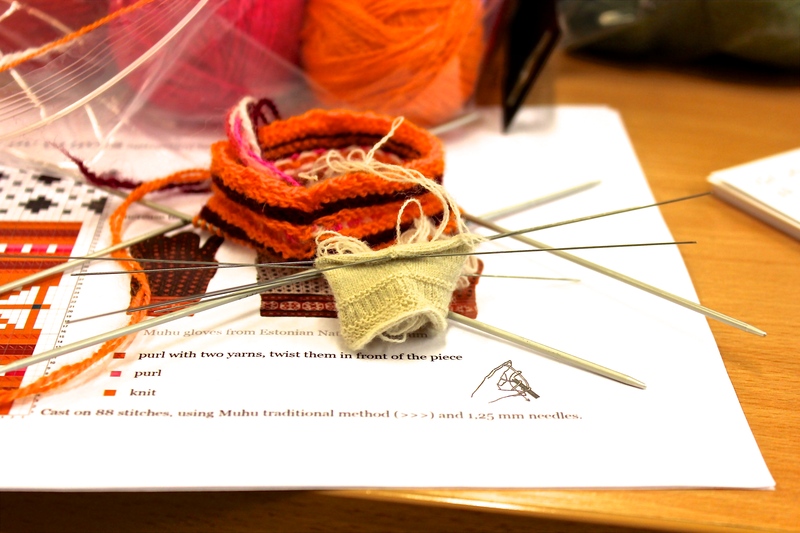 For now a photo of a work in progress by the Knit Master of my guild, Marianne Wasberg. It’s a miniature two-endknitted piece intended to be a brooch one day. Needles 0.5 mm. My first attempt at Estonian mittens with needles 2 mm in the background (I’m now down to 1.25 mm in my third attempt). Quite a difference in those two knittings, isn’t it? Marianne’s needles are so fine that I don’t think I could use them. I wouldn’t be able to see what I’m doing. She’s an amazing knitter. I’ll show more of her work later. I LOVE the white and the fineness of it. Good job and fun, fun with your electric colours! Enjoy……..